SCHUBERT IN ROCK, a project made by Klaus Schubert, lead guitarist of NO BROS, is ready for the second chapter. In 2013, SCHUBERT put together several hard rock artists to record new versions of NO BROS’ greatest hits. Tony Martin, Biff Byford, Joe Lynn Turner, Marc Storace, DoogieWhite, Bernie Marsden, Neil Murray and Don Airey. 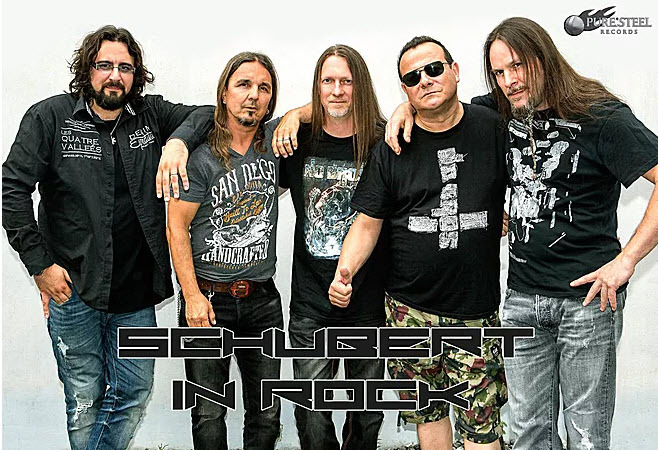 New SCHUBERT IN ROCK project features now a line-up pretty impressive with Marc Storace, DonAirey, Jennifer Batten, Carl Sentance, Scott Soto, Doogie White, Michael Vescera, Dan McCafferty. Surely a classic Hard Rock platter, forged in 70’s mood, when Hard Rock was a well balanced mix of blues, Hammond, solos full of inspiration and..heart! The contribution of every artist fits in the best way..to remind the “total war” guitar vs. Hammond with Don Airey in UNDER THE LIGHTS, or the heartwarming voice of Dan McCafferty in TOO LATE. An album all to enjoy that we suggest!